Advance Crocheting. Put the finishing touches on your newly acquired Crocheting Skills, with Advance Crochet Stitches and Patterns with Step by Step Instructions with Detailed Pictures to finalize your skills. The Final Book in How to Crochet series. 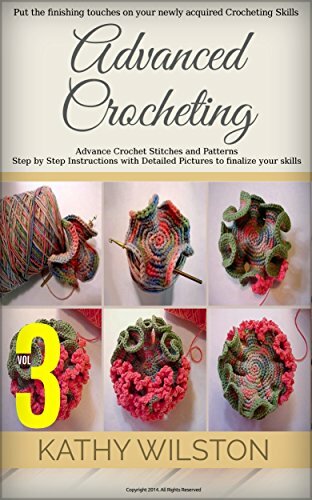 This is the book you must buy to put the finishing touches on your Crochet Skills. DO not miss out on the last step on becoming an Expert. It is the joy of creating something beautiful with your own hands that has me hooked on crochet. I love to see my projects develop as I work with my hook. Another favorite part of advancing my crochet skills if finding and tackling advanced patterns. It gives me a real sense of accomplishment when I get it right. Now I still have to frog my projects, no one is perfect, and each project doesn’t have to be perfect to be beautiful. But I get a real thrill from trying new stitches and techniques. No matter how advanced you may become, you can always learn something new. Don't waste time, Learn this today! This is the book that will show you all the Advance Stitches and Patterns you need in your Expert repertoire. All crochet stitches are variations of slip stitches, single crochet, double crochet, and treble crochet. How you combine and work these stitches determines the complexity and difficulty of your patterns. Now a pattern doesn’t have to be hard to be considered advanced. Most advanced patterns are a combination of basic stitches combined in a unique way to give your project texture, pattern, and beauty. The following stitches are some I’ve learned while working on advanced and intermediate patterns. Mastering these will help you to expand your crochet skills and open up your imagination to new ways of combining stitches on your own. Are you going to miss out? Grab this Deal while it's still here!